“George Washington slept here.” That claim is made by the owners of countless inns and houses (and their realtors) on the east coast of the United States. Some of those claims might even be true; after all, General Washington had to sleep somewhere while he was on the move. In London, a similar assertion is made about many pubs: “Charles Dickens drank here.” He probably did, too, since writing is an activity that can make one very thirsty. In 1770 he came upon Australia and charted its eastern side. There’s a place called Cooktown where his ship, the Endeavour, was beached for repairs after a close encounter with the Great Barrier Reef. There are the Cook Islands in the South Pacific. As you probably guessed, they weren’t known as the Cook Islands before he arrived in the 1770s. Much farther north is Cook Inlet. It’s near present-day Anchorage, in the Gulf of Alaska. The Captain charted that area in 1778. Earlier in his naval career, young James Cook had drawn charts on the other side of the North American continent, surveying the St. Lawrence River in Quebec, and a little later, Newfoundland. Basically, the Royal Navy dispatched Cook to places for which no navigational charts existed, and even to places that no one was sure were actual places. He was sent off to the unknown, and came back with lots of useful knowledge. Another of Captain Cook’s remarkable accomplishments was that when his ships returned to England after years-long voyages, none of his men had died of scurvy. That just didn’t happen back then — that particular debilitating illness was an occupational hazard for seamen, more than drowning or cannonballs. Consider this: During the 18th century, more British sailors died from scurvy than from enemy action. We now know that scurvy is caused by a lack of vitamin C, but fruit smoothies weren’t part of sailors’ diets back then; they mostly consumed some combination of biscuits, beer, beef and bugs. Captain Cook didn’t impose doses of lime juice on his sailors, as the story sometimes goes, but he did insist on high standards of cleanliness aboard ship, and laid in fresh provisions as often as possible — which apparently included fruits and vegetables. The Captain was occasionally annoyed by Tahitian and Hawaiian attitudes about sharing property. Specifically, they tended to want some of his stuff and he didn’t always want to let them have it. In a dispute over a small boat that technically belonged to the Royal Navy but had been appropriated by locals, Captain Cook was killed at Kealakekua Bay on Hawaii’s Big Island in 1779. He was fifty years old. With that unfortunate exception, Cook had, as the Encyclopedia Britannica puts it, “peacefully changed the map of the world more than any other single man in history.” The down side, in terms of his reputation, is that he didn’t spend enough time in London for any pub owners to claim that Captain Cook was a regular. 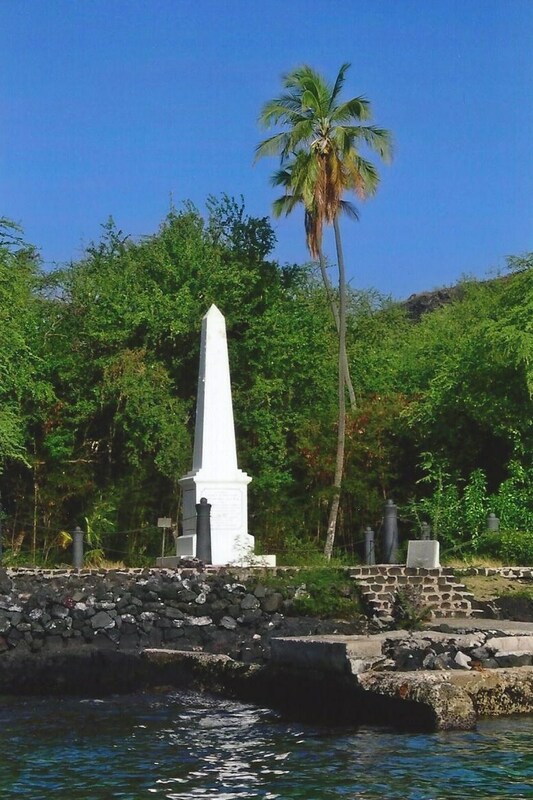 This entry was posted in History and tagged Captain James Cook, Kealakekua Bay, scurvy. Bookmark the permalink. Fourty or more years ago my English grandfather told me lemons were prevelent on good ships where captain’s were pro actively trying to keep their crew healthy. It must have been difficult to replace crew during a long trip. My grand dad said beer was included in most meals and the lemon slice was added to help clean the glasses where fresh water was at a minimum. We also have a family recipe for a cabbage, vinigar and onion preserve that is put up in glass jars and will last for years. Our family makes it occasionally and it’s really good. None of us has scurvy! The lemon tree (Citrus limon) is a small evergreen indigenous to the forests of northern India. It bears bright yellow segmented fruit that, together with lime, orange and grapefruit, belong to the citrus family . Although there is some doubt about their origin and distribution, it is thought that lemon trees were introduced to Europe by Arabs, probably around the eleventh century. In the past, lemons were the mainstay of prevention and treatment for scurvy, a disease that results from a deficiency in vitamin C.
Lemons were traditionally taken on long sea voyages and the juice given to sailors in order to prevent scurvy. Wow, thanks for all the research, Sara! It’s true that citrus was used for quite a while in the British Navy, hence the nickname “Limeys”. Some were using limes as a preventive for scurvy back in the 1700s, but Cook had a different idea. He thought sauerkraut would keep his men from getting scurvy. Seriously. From what I read, there is some ascorbic acid (the important ingredient in vitamin C) in sauerkraut, but not as much as there is in citrus fruits. And if I was on a long sea voyage, I think I’d get tired of sauerkraut before I got tired of lemonade.